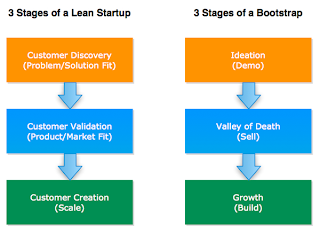 While not the same thing, Bootstrapping and Lean Startups are quite complementary. Both cover techniques for building low-burn startups by eliminating waste through the maximization of existing resources first before expending effort on the acquisition of new or external resources. While bootstrapping provides a strategic roadmap for achieving sustainability through customer funding (i.e. charging customers), lean startups provide a more tactical approach to achieving those goals through validated learning. Steve Blank wrote a similarly titled post to address this mis-definition. Yet, I still hear lots of people wrongly associate the word “lean” with “cheap”. This characterization isn’t entirely misguided but it only captures a sliver of what being lean is all about. Eric Ries co-opted the term “Lean” from “Lean Thinking” which comes from manufacturing. Being lean is not about being cheap but being efficient with resources..
Money is just one of those resources and there is a time to conserve spending (before product/market fit) and a time to spend (after product/market fit). Most bootstrapped startups start with some form of initial self-funding (sweat equity, credit cards, savings, etc.) and work their way towards sustainability through customer acquired funding. However, given the type and stage of the business, even bootstrapped companies can and often do choose to raise additional capital if that’s what’s needed for growth.